One of Australia’s best loved authors, Elizabeth Jolley (1924-2007), was widely read and celebrated internationally, but has had limited exposure to American readers. Persea Books is trying to change that with the publication of a trilogy of autobiographical novels in one handsome volume. My Father’s Moon and Cabin Fever have been out of print in the United States for a long time, but the third book in the trilogy, The Georges’ Wife, has never been published in the U.S. at all. 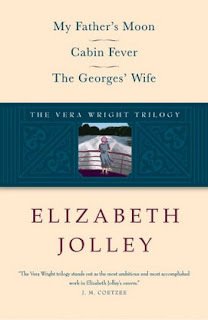 First published when she was in her early 50s, Jolley was the author of 15 novels, four collections of short stories and four books of non-fiction. During the years of her active publication, she won every major Australian literary award and was nominated for the Booker Prize. The constant sound of television might be for a great many people what a mountain stream was to Wordsworth. Instead of these, I have the sound of doves. The Vera Wright Trilogy deals with issues of love, sensuality and family from a perspective that many Americans will find exotic -- being a woman in England and Australia in the early middle part of the last century. What one also finds, however, is a deep humanity -- often shot through with a dark and resonant humor -- that is easy to respond to, regardless of continent.